Well . . . sometimes the adventure is just inside one's own mind. 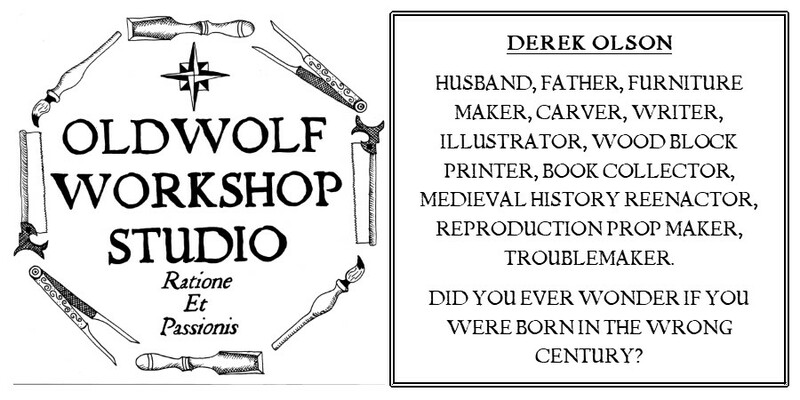 Today I did do quite a bit of work in the shop, honest I did, but you wouldn't really know it by seeing what I had to show for it by the end of the day. The project for today was to get further along down the path towards teaching myself to sharpen handsaws, and by the end of the day I had accomplished what I set out to do, not everything I set out to do, I'm not done with the four saws yet, but I did finish one of them and get myself set up with everything that getting started encompasses. First I spent the morning re-reading and going over all my sources and notes about the job before me. 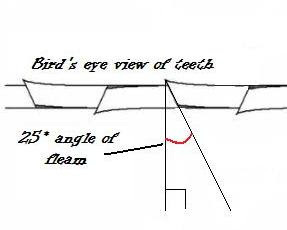 It really can be a relatively simple process, once you understand it, but to get there you have to dissect down the geometry of the saw teeth and the relationship between the shape of the teeth, and the work you expect them to do. I'm not going to try to re-teach the concepts of rake and fleam here. That has already been done much better than I could dream of doing it. I'm going to just try to give two quick and simple definitions here so as I talk about the choices I've made, those who have yet to learn will not feel like they are trying to learn to speak Swahili on the go. 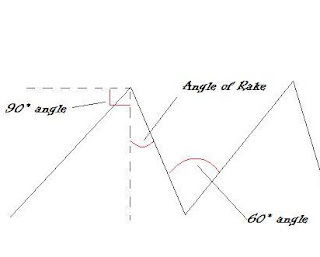 Rake is the angle of the saw tooth in relation to it's axis along the length of the blade. I know, I know, what? No worries. A picture and a thousand words and all that . . . I have read a a ton of stuff on this trying to prep myself for what I felt was an intimidating task. Of course like everything else, for every person who writes about the task, there is a different opinion about how the task should be carried out. Of course a rip saw has a different rake and fleam from a cross cut saw, but the variations different experts place on those themes meant I had to put some real thought into my plan of attack to decide what seemed reasonable and right to me. As I researched and prepped, it dawned on me that nobody I was reading was wrong, They all had to be right, it was just that there was just more than one way to skin this cat. The realization that a good, sharp saw that would cut smooth and fast, could result from a multitude of different techniques was an small epiphany. This took some of the pressure off me, now I didn't have to worry about recreating an exact science. I just had to be careful and consistent with what I chose to do. Bear with me a second while I give a shout out and a big THANK YOU to the great sources that I used the most to get started. First, and maybe most, I referred to my well thumbed copy of The Complete Sharpening Guide by Leonard Lee (of Lee Valley Tools) all the basics were here for me in this great book that set me on the path to specifics I found later. This inspiration is closely followed by a very instructional podcast done by Bob Rozaieski at the Logan Cabinet Shoppe web blog. His video focusing on sharpening a handsaw, was simple, straight forward and seeing it done gave me the courage to move forward. 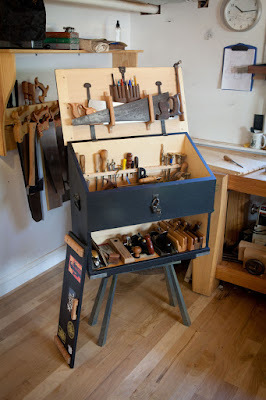 I also read and re-read all the tips and tricks given by Mark Harrell at Bad Axe Tool Works, There was also a great article in an old issue of Popular Woodworking Magazine (Oct 2005) called "The Secrets to Sawing Fast" by Arts and Mysteries writer Adam Cherubini. The final big help was a web article called "Saw Filing - A Beginner's Primer" over at vintagesaws.com. One of the ideas I read that interested me was what guys like Mr. Harrell and Mr. Cherubini were using when they sharpened their own saws. They both use variable rakes along the length of the saws, this gives them different cutting features depending on which part of the blade is in contact with the wood. For example a more aggressive angle of cut in the center for the blade for speeding the attack on the wood vs. a more relazed angle at the toe for starting the cut. I really like this concept because the ability to easily achieve this variation to speed and help your work places a whole new justification for the sharpening process and would seem to increase the enjoyment and satisfation in actually using these saws to make sawdust. Here was a very good reason why you would really want to learn to do this. (Other than the other obvious benefits of getting to use a sharp saw) For hybrid woodworkers like myself, the ease of use adds to the sweetness of using a handsaw and will probably lead to my continuing use of these four brothers once I can get a shop that will allow room for my tablesaw again. After taking a ton of notes and weighing all my options I came to a decision about how I would proceed. With my crosscut saws I would divide the length of the blade into quarters, I'll sharpen the quarter at the toe and heel of the blade at a 20* rake with a 20* fleam and the center half of the blade at a 15* rake and 20* fleam. This should give a smooth starting saw with a more aggressive center. The 20* fleam is not a super aggressive angle but I understand it will allow for a smoother finish on the edges of the board. For rip saws I will start with a 20* aggressive rake for the first quarter at the toe, follow with a 12* rake through the center half and a smoother 5* rake at the heel quarter. Rip saws traditionally have a 0* fleam, but after reading I decided to add a slight 4*-5* fleam to help if the saw is cutting at an angle, or coming across a difficult grain pattern in the wood. You sharpen using a triangle shaped file and you hold those angles by utilizing several shop made angle guides. as you can see on the blocks in the picture I have drilled a hole for the end of the file to fit into, Then I took and measured out the angle I wanted the fleam to hold at and drew a reference line. Now when I force in the file, I angle one face of the triangle to line up with line. Now as I file away all I have to do is try to hold the block realtively square and straight and the angle will be transfered to the teeth. After all the set up and work I only managed to reshape and sharpen one saw today. I chose to start with the crosscut saw with the plastic handle. One, because crosscuts are more work intensive than rips and I wanted to jump into the deep end on this, and two, out of the four saws, if I really screwed up the plastic handle one I guess I wouldn't feel like such a bad person. The plastic handled one, though potentially more difficult, due to it's crosscut pattern, seemed to be the safer choice. After a few hours of work at the saw vise, I finally finished the job of sharpening and took the blade for a test drive in a section of 2X4. The result? A nice, smooth, fast cut, that was easy to start. I feel like I have really accomplished something tonight and I'm ready to jump back to it and finish up the other saws now. In the end, a lot of work with a satisfying result. It's tough to ask for more than that.